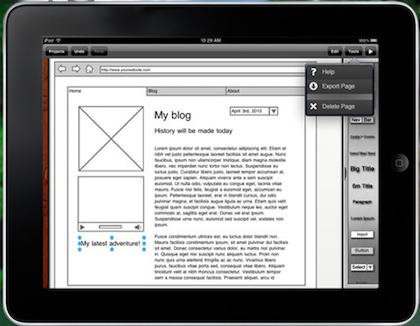 Laying out Web pages and project UIs on the iPad – iMockups is on sale this weekend! 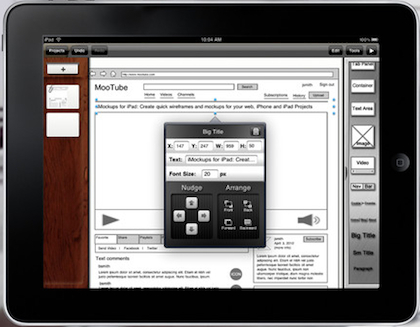 We covered iMockups for iPad back when it first came out. It seemed like a good idea, we could quickly create multiple Web pages for projects on the iPad before anyone had to do heavy coding. It would appear the app may have been more of a hit than we thought since we are still using it. Apps come and go or just get forgotten about in the depth of the iPad’s Launcher folders, but iMockups is still on the first page so for all of it’s pros/cons, the pros are winning out. This weekend, the developers of iMockups for iPad are offering a big discount so we thought it was time to mention the app again. If you don’t recall, iMockups is a iPad only app that lets you drag/drop Web page bits, linking multiple pages together so you can do a pretty good experience walk through. The graphics and interface is designed for quick use. Drag a text box there, resize it, move it a bit that way, add a description, add text as a place holder and move on. The app works pretty nicely for our iPad/iPhone app workflow too. Most recently, on a Web site enhancement project in the area of proving a better download experience, we had an initial layout done by one person who emailed the iMockups file to everyone and they played on their own iPads with their ideas. The next week we walked through everyone’s tweaks to see they actually would work. All without any hard coding and with full exposure since everyone’s idea was touchable rather than just whiteboard idea drawings.